Bol is our simplest expression of organic minimalism. 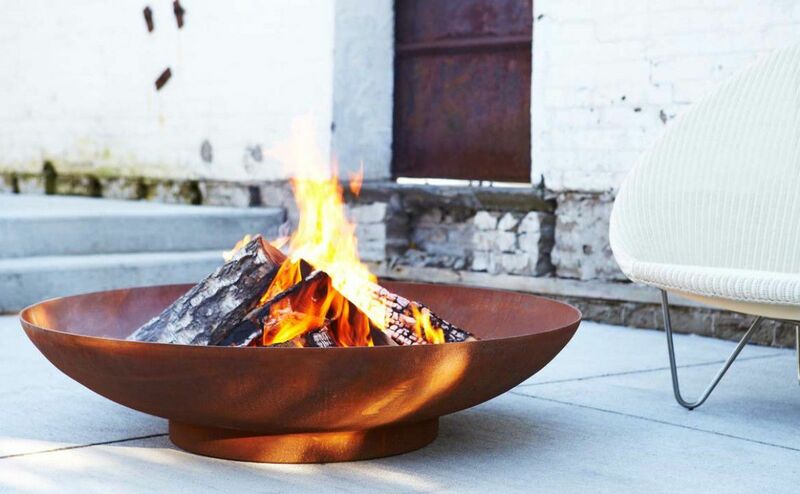 A wide, shallow vessel spun from 3/16” Corten steel, Bol fire pit’s low profile, fine edge detail, and patina finish are simultaneously elegant and earthy. With a 42” diameter, Bol is a dramatic centrepiece for any outdoor space. The Bol modern fire pit may be ordered with a steel grate insert for wood burning, or with your choice of natural gas or propane burners. Our burners, approved to CSA and ANSI standards for the U.S. and Canada and CE certified for Europe, feature choice of ignition systems: a manually-lit pilot with safety thermocouple, which prevents gas from flowing when the fire pit is not lit; or electronic, with a spark pilot that is controlled by a switch. At 69,000 and 60,000 BTu/h for the natural gas and propane firepits respectively, they provide a beautiful flame and cozy warmth to extend your enjoyment of the outdoors into the chilliest seasons.